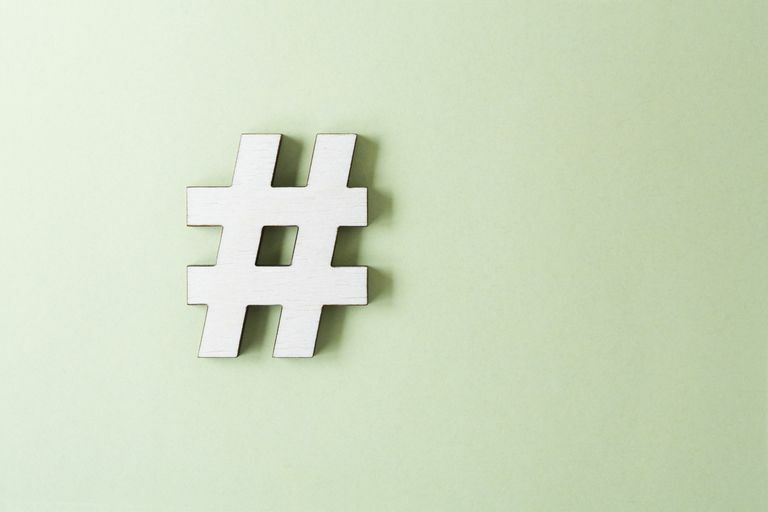 A hashtag is marked by the # sign in front of anything; it only works, though, if it's in front of a word (or string of words not separated by commas). Hashtags in front of numbers or emoticons just look silly. Because c'mon. Pound signs in front of words are the pinnacle of professional writing. Usually, you hear them referred to as "pound [topic]" or "These tweets have been tagged with [topic]." Or, at events, you might hear the organizers say, "We'll be using the hashtag [topic] for today's program." If you're hosting an event and you want to tell attendees to use your hashtag, do a simple Twitter search to find out if it's already being used. Most savvy event planners will choose one that abbreviates the name of the event and includes the year. Like #EventName2013 or #EN2013 or #EN13. Originally, hashtags were for ease of searching and categorizing tweets around a certain topic. They created virtual chats on the fly in the cocktail party that is Twitter so that the people who were chatting about #FuzzyDice weren't having to hear the people talking about #FuzzyKittens. And, none of them had to be bothered with the moms reading bedtime stories about #FuzzyWuzzyWasABear. But, as with all good things, they have come to be used properly, poorly, overly, and ironically. For instance, the #quote tag is handy if you're looking for some typically inspirational, slightly sticky, smarmy gem of 280 characters or less. Why you'd just do a search on #quote and find an infinite-scrolling list. But, within your own feed, that you get based on who you follow, you'll see random quotations occurring regularly tagged with #quote. As if you couldn't tell by the quotation marks and the attribution to someone else. With only 280 characters to work with, every character means so much and must carry its own weight. #TweatYourWeakness is trending. Obviously, Twitter's weakness is spelling. Hashtags were first used in 1988 on a platform known as Internet Relay Chat or IRC and like today, they were used to group text, images, etc. In October of 2007, Nate Ridder, a resident of San Diego, California started appending all his posts with the hashtag #sandiegofire. It was intended to inform people worldwide about the ongoing wildfires in the area at the time. Stowe Boyd is the blogger who was first said to have officially called them "hash tags" in a blog post in August 2007. By July of 2009, Twitter hashtags were formally adopted by Twitter and anything with a # in front of it became hyper-linked. Hashtags.org exists, but there's no real conclusive archive of hashtags. You're almost better off just making up your own and typing them into search! One thing to note is that nobody owns hashtags. Also, there are no rules or guidelines. When you add the hash symbol before a word, it becomes a hashtag and anyone else can grab it and exploit it. It becomes troublesome, especially in business, if it's hijacked and used nefariously.